Ender smiled. Despite Jane’s vast wisdom, she had no understanding of kinship. Though she had been created by humans and conceived herself in human terms, she was not biological. Jane is more than Ender’s virtual personal assistant. She’s Ender’s closest friend and constant companion. She runs his programs and searches, schedules his travels, and knows Ender well enough to tease him. You already know where we are going with this. Yes, we are talking about Apple’s Siri. 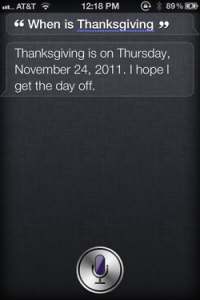 Siri is a voice recognition software for newer Apple devices. The program, voiced by a female named Siri, can schedule your appointment reminders, give you the weather forecast, and even tell you a joke. Siri cannot whisper, but her voice through a bluetooth device would be very similar to Jane’s voice in Ender’s jewel. While these things are handy, what really relates Siri to Jane are Siri’s sometimes unexpected remarks. Siri is programmed with more than enough cheeky responses to remind ‘Ender’s Game’ fans of Jane’s sassy attitude. For example, tell Siri that it is your birthday and she begins to sing “the happy birthday song” only to stop and remind you that she cannot because the song is copyrighted. Siri may not be a sentient being like Jane, but she has enough whit that someone created this website. On a final note, if you have ever contemplated changing your Siri’s name to Jane, Apple does not allow it. We’ve tried. Have you ever thought, “This reminds me of ‘Ender’s Game,’” while reading an article? Our new column, ‘Beyond Fiction’ is dedicated to sharing those stories. Each Saturday we’ll publish a piece both reminiscent and beyond the fiction of ‘Ender’s Game’. Of course, if you’d like to nominate a feature, please contact us.